Gift boxes of our popular 6-flavor assortment! Know someone who likes to try a little bit of everything? Their eyes will widen with delight when they open a colorful box of our Fruit Delights candies! Each of our tempting flavors are distinctively different, but so equally delicious they might have a hard time choosing a favorite. They're sure to love all six orchard-fresh varieties: slow-simmered Strawberry-Walnut, marmalade style Orange-Walnut, cool mountain Blueberry-Pecan, sweet island Pineapple-Macadamia, tangy ripe Raspberry-Pecan, and summer-fresh Peach-Walnut. Kosher. Why can I get these delicious candy from Amazon for $2 cheaper for same size box and free shipping. I'd much rather buy them from you but thanks to our fabulous economic state of our country I'm saving every dollar or two I can. Just saying..... Still love them though. Of course another great tasting candy from Liberty Orchards. One of my favorites. EXCELLENT!!!!!!!!!!!!!!!!!!!!!!!!!!!!! Old School always ROCKS!!!!!! Delicious!!!!!!!!!!!!!!!!!!!!!!!! Liberty Orchards candy, especially Fruit Delights, has spoiled me forever from buying mass-produced candy products. I love the genuine fruit taste, fresh nuts, and consistent texture of Liberty candies. Nothing is skimpy or second-rate in these marvelous confections. They remind me of home-made things from my great grandma's kitchen. These are the best confection ever made. I've loved them for years and this boxed assortment is so delicious. 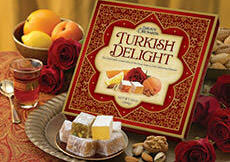 I'll be ordering the Turkish Delights to taste the rose flavored ones. Thanks for a delicious treat! While on a cruise in May we all spent 2 days shopping in Seattle. I shopped at Ross and came across Liberty Orchards, Fruit Delights. I never seen this in Ontario so I thought I would buy a box. They were so delicious I now wish that I had bought more back with me. They were sooo good. I phoned the company and found out there is no stores in Canada that carry this product, why i don't know, I guess I will have to wait till I travel back to the States. These flavors match the fresh fruits and the texture lasts for long enjoyment. http://jwinclos.blogspot.com/2013/08/liberty-orchards-fruit-and-hawaiian.html One of my favorite snacks. Addicted. I am a very satisfied customer because these sweet confections make me happy. Corny but true. This holiday season was my first time and I'm sold. I bought a 7oz box in a Family Dollar store for $3.00.I bought several and next year they will be gifts. WOW. My husband & I received 2 boxes of Berry Delights in the mail on yesterday from one of his Washington state business contact. They are So GOOD! I'm a fruit & nuts Lover! Awesome natural flavors. I must Order some more boxes! Received a gift box, from a coworker. Tried to keep my paws out of it,until after work. But, couldn't resist. Yummy! What a light and sweet treat. Had never heard of Liberty Orchards. But, I will remember it, now. These are absolutely the most amazing flavors. They are my all time favorite candy. I love the nuts added, also. Cover them in chocolate and they are heavenly! Nothing compares. Period. We received a small 7oz box in a gift basket They were wonderful! I opened them when guests were here. If I'd known they were so good, I wouldn't have shared. 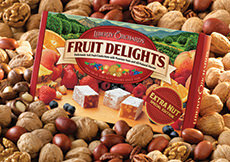 I first tried your Fruit Delights a couple of years ago I am almost 57 years old and not a big candy eater until a box of your Fruit Delight have been brought into our house they are absolutely one of the best candies I have ever eaten and I have tried some very expensive candy before, and believe me it ranks right up there with it. Keep up the good work. And thank you for such a great candy eating experience. What is your favorite indulgence? That just perfect lil bite that makes you smile all the way down to your toes. Can you get it at anytime or is it seasonal? Well I thought mine was only a holiday one. But I found out today it is not. Normally every year at Christmas I stock up on Liberty Orchard fruit and nut candies. These are lil bite size morsels of fruit gels with nuts in six orchard-fresh varieties: slow-simmered Strawberry-Walnut, marmalade style Orange-Walnut, cool mountain Blueberry-Pecan, sweet island Pineapple-Macadamia, tangy ripe Raspberry-Pecan, and summer-fresh Peach-Walnut. I adore them. Stack the boxes on my nightstand and have one every evening as my own special treat. So much so that I hate to even share. I know how stingy. But once they are gone I have to wait a whole year to get them again. I have to say this was a red letter day for me. Yummy goodness that is all good for me too. YIPPPPEEEE! You can get a catalog with coupons in it too. Thanks so to Liberty Orchard for sending me my treats. I am a thrilled to know I do not have to ration out these gels one a night to have them. And more so that they are just a click away. Liberty Orchards confections were a staple of the holidays when I was growing up in the Seattle area. My grandparents always made sure there were plenty when we came over to celebrate Thanksgiving, Christmas, or any other family occasion. I recently ordered some for my wife as an anniversary gift, and I am happy to report they are just as wonderful as I remember. Excellent service, delicious candy, five stars all the way around! I love your Aplets, cotlets, and Fruit Delights. They are my favorite candy. In the past I have only found them in a few stores around Christmas. Wish I could find them in stores year around, because shipping and handling makes them a bit expensive. I order them anyway because they are so incredibly delicious. I love these! After first tasting the excellent Aplets and Cotlets, I decided to try some more of Liberty Orchards delectable candies! The taste and texture couldn't be any better! Very good fruit taste as well! Oh my gosh I LOVE these little things!! So yummy! Wish I could find them on the store shelves year-round, but I have to stock up every Christmas. 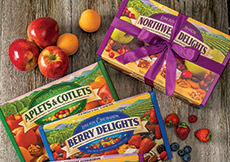 Have enjoyed Aplets and Cotlets for many yeras and tried Fruit Delights several years ago. It's hard to choose between them but the added flavors in the Fruit Delights are a plus. I like them all but my favorites are the orange and the pineapple. I have loved your Aplets and Cotlets for many years. This year I tried Fruit Delights for the first time and instantly fell in love with them too. This year I have given both types of candy as gifts, and everyone who have tried them have loved them too. Thank you for making such delicious candy that both my Kosher and non-Kosher friends can enjoy too! I'm not big on any candy, let alone holiday candy. However this was a real different taste and pleasure for me. I'm ordering more today. 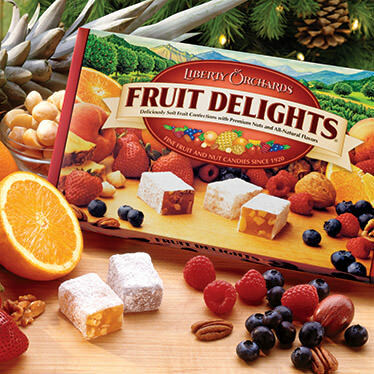 My neice (they are stationed with the Army in WA) sent me a box of the Fruit Delights for Christmas -- they were a first for us and without a doubt the best that we have ever had -- love them. Many thanks for such a great product -- you now have a new customer and fan!! Everything about these little gems is right: the texture with its subtle nut crunch, the delightfully translucent and powdery look, and most of all the flavor which evokes the best qualities of fresh fruit. I agree that they can be addictive--the temptation to "just have another" is powerful! I would recommend these to anyone and everyone, even to people who think they don't like fruit or nuts. I received some as a gift and will be ordering online to stock up in the new year. Keep 'em coming, Liberty Orchards! I bought these last year as an after-Christmas markdown @ a Walgreens, just to try something new and got immediately hooked. I am very much a chocoholic but was pleasantly surprised by these. This year I had to hunt for these and finally found them; these will become a new Christmas tradition. I fell in love with your candies. I made my first purchase at Casa de Fruita in California and was I hooked. I drive a truck for a living. Last Christmas I had the pleasure of picking up a load of apples at Blue Star fruit in Cashmire, Wa. So I got to visit your facility. Everyone on my Christmas list received gifts from Liberty Orchards. Your candies are so delicious that there no words to describe them except "unbelieveable". 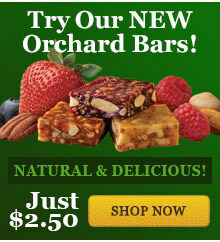 I just picked up a box of Liberty Orchards Fruit Delights and they are delicous! Very moist with full fruit flavor. I WILL be buying this brand again. OMG! I just bought a box from Ross Dress for Less. I could not just eat one I ate 4 pieces. The fruit Delights are FINGER LICKING GOOD! I will try not to hurt myself! I love these Fruit Delights! Delicious flavors,fresh and the texture is nice. Warning, they can become addictive! To me anyway! Omg!! These were so delicious..I'm glad I shared them with my husband or I would have ate the whole box! A friend gave me a box of your candies, Fruit Delights, for my birthday. It was a very wonderful surprise, as I had never heard of your product or name before. I took one bite and was in heaven. I started to share them, but when I saw others were also very impressed by your candies, I slyly hid them. They remind me of the Turkish Delight that I loved as a child (my grandmother used to bring with with her - rose flavored). I wonder if you make those? Thank you for making such extraordinary treats! They were perfection. Sincerely, Helen Liberty Orchards reply: Thanks, Helen! We're glad you enjoyed Fruit Delights, and Yes, we do make a more traditional Turkish Delight which goes by the name of Locoum Delights. You can find them on our website. Every flavor was fresh and fruity-tasting. So great with the touch of different nuts to complement each fruit. Just soft enough to be easy to eat and chew. Aplets and Cotlets were equally as delicious! I received two different boxes of the fruit delights, each selection was outstanding. What a wonderful surprise to have the opportunity to endulge in these candies, and what a wonderful friend to give them to me. This candy is excellent, I purchased one box, then bought 3 more and told my friends about it, bought all the store had for gifts. Fruit Delights, keep up the good work. I've never cared for jellied type candies. The colorful box of your Fruit Delights on the shelf at a local store caught my attention (great packaging). Had originally intended them as a gift. Glad I kept them. Absolutely WONDERFUL! I received my box as a Christmas gift -- and almost gave it away (i'm more of a chocolate person.) I was intrigued by the flavor selection & decided to give them a try. EXCELLENT! It really taste like homemade candy. I love the strawberry walnut & pineapple macademia. And I love how they are still made in Cashmere. I will be trying your other products very soon. There is an oily smell in some of the pieces. Worried that people might think that I gave old stock that had been sitting in the pantry for months. I wish it had been as how it used to be few years back. Liberty Orchards reply: Sri, we're very sorry to hear this. We maintain the highest standards of ingredient selection and storage, and complaints like this are extremely rare. However, there is always some quality variation with agricultural ingredients, and this is especially true with nuts. We suspect that the oily smell came from a loss of shelf life in the nuts. Some nuts simply deteriorate faster than most, or exposure to heat in transit or storage could also cause an oily smell to develop. Please be assured that this is not normal with our products, and we'll be sending you replacement product, which we're confident will meet your high standards. Thank you for bringing this to our attention. Happy New Year. It was a lovely surprise receiving these delicious sweets as a gift from a friend coming back from the US to Colombia. Quickly we took a look into the web page discovering more possibilities of delight! THE BEST CANDY I HAVE EVER EATEN. My daughter wants this every year! I buy these every year for my daughter, it is her favorite candy and she so looks forward to opening it at Christmas time.